Ever since I read The Da Vinci Code by Dan Brown when it first came out, I have been fascinated by novels that manage to combine science and religion with historical mysteries and the quest for ancient treasures. Add to that a dash of action and adventure in an exotic locale and you’ve got the perfect package. 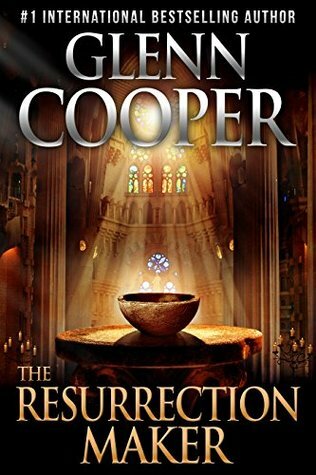 Glenn Cooper’s latest thriller The Resurrection Maker seems to tick off all the required boxes. By all accounts, Arthur Mallory, chemist, treasure hunter and Grail enthusiast, is a very regular young man. His ordinary life takes a drastic and dramatic turn when he is a witness and the victim of a violent crime in which his friend, and fellow Grail Loon, Andrew Holmes dies. In an attempt to put things right, he embarks on a quest to uncover the culprit of his friend’s death and finally unravel the mystery of one of the most intriguing historical mysteries of our time, the existence and location of the Holy Grail. He is joined by the beautiful and mysterious physicist Claire and together, piecing together clues set out hundreds of years ago, they travel across Europe on a hunt for the elusive Excalibur sword made famous by King Arthur and the Holy Grail chalice. Will these two adventurers find their treasure or will the Khem, a secretive and sinister society foil their attempts and take possession of this ancient artifact said to possess almost supernatural powers that could possibly shed light on the actual resurrection of Jesus Christ and offer immortality to humankind. The Resurrection Maker started off wonderfully, seamlessly blending story lines from the past and present that were intriguing and caught and held my attention for about the first two thirds of the book. Unfortunately, this did not hold true for the remainder and in fact truthfully told I actually had some difficulty and even a lack of interest in finishing the book. I am a huge fan of Glenn Cooper and was somewhat disappointed by this latest novel. In terms of character development, blending of historical fact/fiction and action sequences, The Resurrection Maker did not come through and was definitely not up to par with his previous works. If you have never read anything by Glenn Cooper but think that you might want to check out one of his books I would recommend you start with his Will Piper trilogy: Library of the Dead, Book of Souls and The Librarians. These works showcase Glenn Cooper at his very best. Thank you to NetGalley and Lascaux Media for providing me with an e-reader copy in exchange for an honest review.